Gryffindor patch - got to show some house pride, right?! Joules hare keyring* that's just too sweet to get bashed around inside my bag every day. Instax photographs from many years ago. A chocolate frog box. The chocolate frog was eaten long ago but there's a Dumbledore wizard card inside. A chocolate frog keyring that really does smell like chocolate. Again, too pretty to use! A Desk Bunny so that a pair of scissors are always handy. Although I do forget that they are scissors more often that I would like to admit. It's the little things that make a house feel like a home, they give the walls a heart and a personality all of their own. Knick-knacks are my favourite. They're tangible versions of memories shared with loved ones, mementos from special places & objects that simply provoke a smile for no particular reason. I'm not the best with them, dusting isn't my favourite chore and little things makes the job a little fiddly, but I think it's worth it. For the smiles. For the memories that wash over me if I glimpse them throughout the day. For the heart they give our home. Happy Friday. I hope you have a wonderful, wonderful weekend. I love knick knacks! The title of this post reminds me of the Pixar short. :) That hare keyring is so cute! This is a lovely post! And I bite my nails too...wish I could stop! Me too, I bite my nails out of boredom and then they look horrible so I bite them more to try and shape them. I'm terrible. Love your blog by the way Annabel! Oh I really love those desk bunnies! I saved my chocolate frog box too, with the Dumbledore card as well! Seeing as it was 8 pounds I definitely wasn't gonna throw it away haha. That's such a cute little set-up. I love the Gryffindor patch!! The desk bunny is super cute! The top of my book case is filled with knick-knacks. They all have memories associated with them so it's nice to look back and reminisce. You have the cutest things. I've tried to find that desk bunny but think I will just have to snap one up from online. 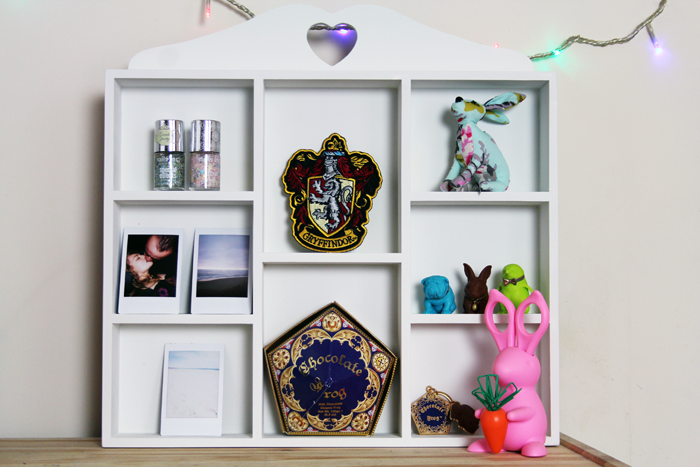 I have so many Harry Potter knick knacks around my room too ! Cute ! Really love the cabinet. It's a great way to display those treasured possessions! I think id be the same and keep the chocolate frog packaging too! 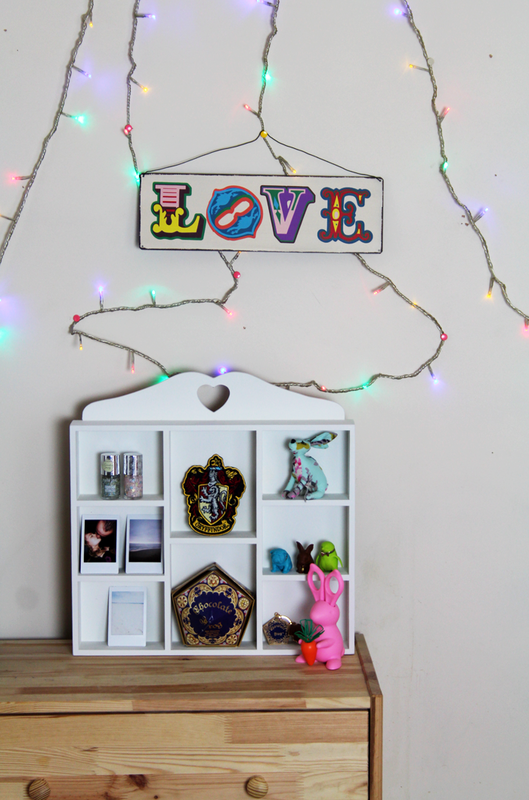 I'm hoping to get some old printer trays to put in my bedroom I'm in the midst of redecorating and then I can add little trinkets and memories. I love knick knacks. Mine aren't this organised though, just sort of spread all over my room! 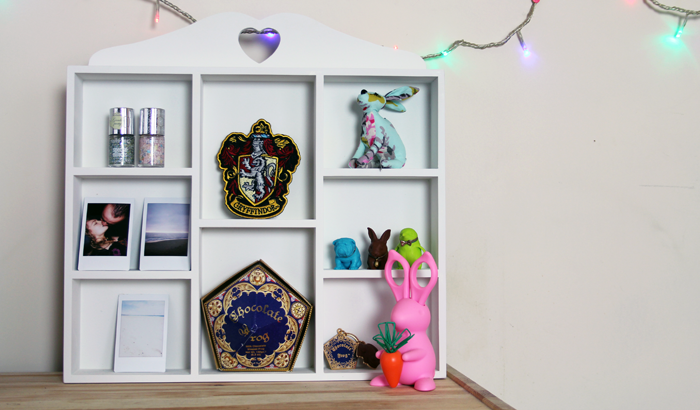 That's such a cute little shelving unit! I definitely need that desk bunny in my life, too. I have the same Joules keyring :) It's just sooo cute! I'm really in love with the fairy lights too! Oh how cute is this cabinet?!?! Adorable, I need something like this in my life! What a lovely display cabinet, I really want one on my desk! I got an instax camera not too long ago, and I love it! It's just too bad I'm still playing around with it, as half of my photos turned out good and film is expensiiiive. Jealous of those Chocolate Frogs and Gryffindor patch! This is such a cute way to display tiny bits and pieces. I love all the Harry Potter themed things. That display cabinet is adorable! I love the desk bunny too - I'm always losing scissors. I'm just a tad jealous you had a chocolate frog! Pretty. I'm glad I'm not alone in keeping my chocolate frog box. Love the display cabinet, so adorable!